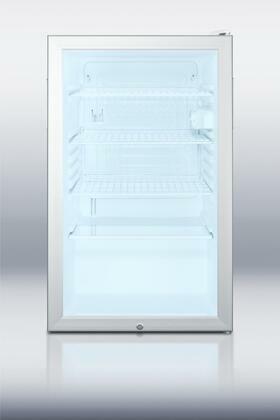 The SCR450LADA is an all-refrigerator with a 4.1 cu.ft. capacity. It has a white cabinet with a reversible glass door and keyed lock. A hospital grade cord with a 'green dot' plug offers additional safety in high traffic areas. Inside, the SCR450LADA includes adjustable shelves for attractive and convenient storage. The interior light functions on an on/off rocker switch and an adjustable thermostat offers easy temperature control. At just under 20" wide, SUMMIT SCR450LADA is an easy-fitting ADA compliant beverage refrigerator fit for any setting. 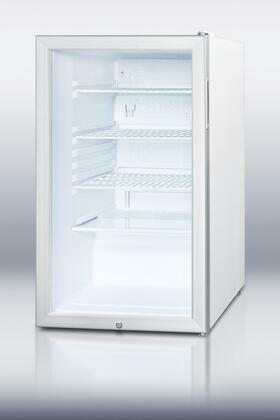 Refrigerator Capacity: 4.1 cu. ft. Depth with door at 90°: 451.375"
I looked everywhere for an ADA glass front compact Refrigerator at 32". Finally found one here, it is exactly as described in the ad. Excellent quality and the delivery was fast and arrived in excellent condition. Very happy and would purchase from them again.